Generic Company Place Holder Trivia Master! One of the great things about rounding up a group of like-applications is that after a while it often becomes obvious which is the best among those apps—it’s the one you keep returning to, to “test” some more. Which is what happened when I was assigned to test a trio of iPhone trivia games. I kept returning to Ben Stein: It’s Trivial. The $3 game from Griptonite Games is the most fun of the three I tested. And it seems to be literally less trivial than the other games. The questions and answers are interesting, and there’s a goal, achievable by any player: steal Ben Stein’s stuff. Prize Patrol: The object of Ben Stein: It’s Trivial is to score enough points to grab all of Ben’s possessions. You steal his stuff by accumulating points, and you accumulate points by answering questions in four categories: pop culture, natural wonders, sports, and “random Steinage.” Along the way there are opportunities to win bonus points by answering certain questions correctly, and these points accumulate into the hundreds of thousands. 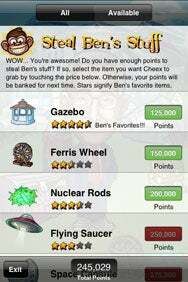 Stein’s stuff is random, and has different point values: a gazebo costs only 125,000 points, while a space capsule is 275,000 and a treasure chest tops the list at 1,000,000 points. There are three unpriced items: Ben’s glasses, Ben’s suit, and Ben’s mansion. Clearly, your mission is to totally wipe Ben out. The questions get progressively harder as the game progresses, and you can win extra points based on how quickly you answer. The game is accompanied by circus-like music, and a bobble-head version of Stein makes facial expressions and sarcastic comments on your answers. These get repetitive and tiring after an hour or so of play, but you have the option to turn off the “sound effects” and music. According to the game’s developers, It’s Trivial includes more than 1,200 questions, and additional “theme packs” are on the way. This number of questions isn’t enough to prevent repeats after an hour or so of play. More are needed in the regular version of the game to move it from the “very good” to “excellent” category. Besides the terrific questions, Ben Stein: It’s Trivial has also been well-produced. It has a slick, intuitive, and fun interface. Mr. Trivia from Iron Square is not so much fun. The $2 game includes more than 700 questions—not many, considering the speed of play; at the same time, it boasts “300+ faux prizes,” which are silly and tiresome (A year at boot camp. Books on Objective C programming. A year’s supply of lipstick. Does it matter?). Unfortunately, many of the questions demonstrate that trivia can be, well, too trivial, resembling the trick queries some teachers ask on pop quizzes to distinguish between who merely did the assigned reading from those who took detailed notes. “It took how many men to build the Taj Mahal?” (22,000, 33,000, or 44,000) Sometimes, a lot is just a lot. “When was the Kingdoms of Korea founded?” (45 BC, 50 BC, or 56 BC) Sometimes, it’s hard to figure out why the exact year matters, even trivially. Question Time: In some cases, Mr. Trivia asks questions where potential answers are hard to distinguish (at least for us amateurs). 50 million tons? 110 million tons? Whatever. It’s heavy. We get it. A little proofreading and fact-checking could have gone a long way toward making Mr. Trivia a decent game. Iron Square also offers a free lite version with fewer questions; Miss Trivia, a drink trivia game that comes in both paid and free editions; and a $1 kids’ game with 250-plus questions aimed at the 4- to 10-year-old set. Pick A Category: Trivia Master boasts more than 3,000 questions in nine categories. 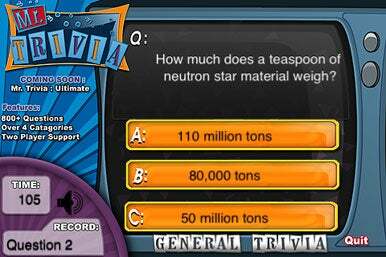 Trivia Master play is simple and straightforward: each round consists of 10 questions in a category, and you can score up to 1,000 points for each question. The number of points you get for a correct answer decreases by 50 a second, meaning if you get a right answer in five seconds, you accumulate 750 points. If it takes 10 seconds, you get 500 points. At the end of a round, the game is over, and your total is added up. That’s all there is to it. I found Trivia Master’s questions to be not quite as interesting as Ben Stein’s, but for the most part the questions are thoughtful and the distinction between answers meaningful. The interface is also simple but well-produced: this is a game with which you can happily pass five minutes, but it’s not addictive, like Ben Stein: It’s Trivial, the champ of this particular trivia showdown. Mr. Trivia and Trivia Master are compatible with any iPhone or iPod touch running the iPhone 2.x software update. Ben Stein: It’s Trivial runs on the 2.2 update.